creative savv: This week (the indoor edition) . . . This week (the indoor edition) . . .
much is going on in our household. After a couple of beautiful spring days, the weather turned cold and rainy for much of last week. When the rain quit and sun came out on Sunday afternoon, I took a walk through the neighborhood and discovered many new "ponds". It had been a wet week, all right! With so much rain, my attentions were turned indoors. Last week was my birthday. Here's the cake my daughters frosted and decorated for me. The cake was a yellow scratch cake. 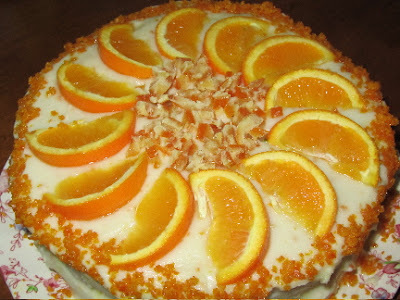 The layers were glazed with the syrup from a jar of runny marmalade, and the frosting was citrus flavored. I have one last slice, tucked in the freezer, for some deserving soul, on some special occasion. This week is my husband's birthday. With two birthdays so close together, we're really not in the mood for more cake. So, for Doug's birthday, I often make his favorite pie, lemon meringue. 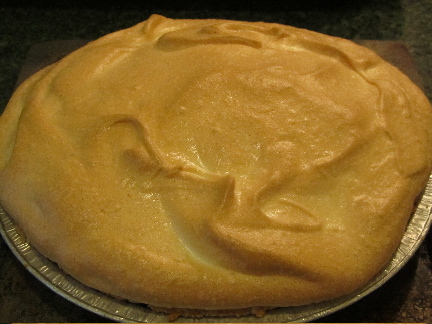 Just so you know, if you're out of corn starch, you can still make a lemon meringue pie. I went to make this and discovered I only had half the required corn starch. 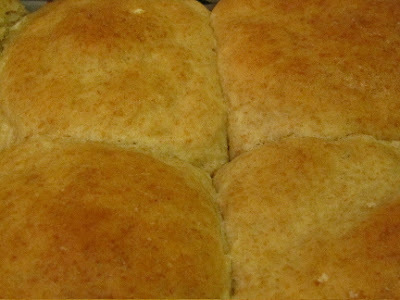 I searched online and found a recipe that called for flour instead of cornstarch. I wanted the firmer texture that cornstarch gives, so I used the half amount of cornstarch that I had in the pantry (used 3 1/2 tablespoons for a 9-inch pie), *plus* half the online recipe's amount of flour (used 4 tablespoons for a 9-inch). It came out beautifully. The texture was creamy and smooth, and very lemony (I increased the lemon juice a bit). 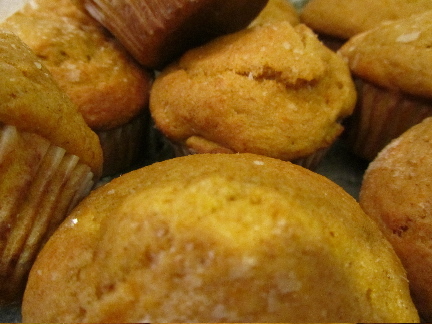 to pumpkin muffins (using up the cooked pumpkin in the freezer). to a fabulous garden lasagna. Sorry I have no pictures of the lasagna, as it got gobbled up pretty quickly. I was using up odd bits from the fridge and freezer, some tofu (mashed and flavored with garlic, lemon juice, and salt), mixed with a packet of pizzeria garlic dipping sauce, topped with several small packets of Parmesan cheese. I blended some chopped kale and carrots into the tofu "cheese" filling. Oh, was this ever delicious! 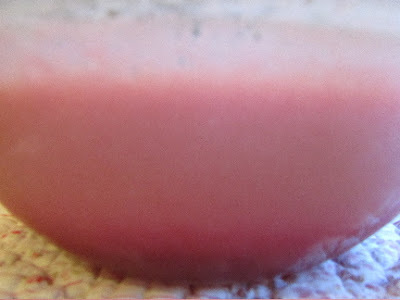 I also began cooking the frozen fruit juice from last summer's harvest, into jelly. 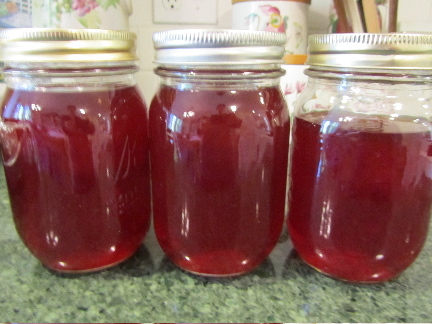 This week I made the red currant jelly. Later I'll make the crabapple jelly. 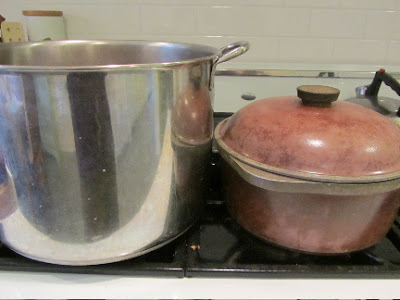 I use a particular method for cooking my jelly, both the juice extraction and the actual turning the juice into jelly. I find that when I take care to be precise, I have greater success. This tried and true method is right here. And here's the rhubarb-cream cheese gelatin that I made Sunday afternoon, for Monday's dinner. It seems to firm up more, if I make it the day before serving. Here's the recipe. I made a pasta salad, adding sliced olives, chopped canned tomatoes, and the florets from kale about to go to seed. They taste like broccoli, so much so, that my kale-loathing husband declared with glee, last week, "there's broccoli in the quiche!". I then informed him that it was kale florets. Much gagging and sputtering followed, with the knowledge that it was kale (kidding, he's a good sport!). Anyway, just before the kale goes to seed, I pluck off the florets and use as I would broccoli. 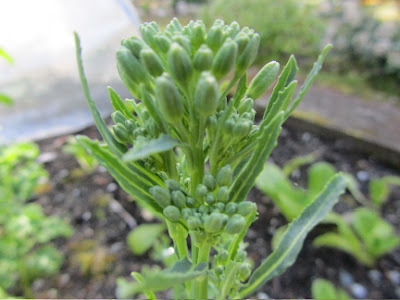 This is the kale that I planted last fall. my daughters finally made their university choice for next year. It was between the large state university and a small private university. Either one would be a good choice. We looked at a variety of criteria, from having the right programs and courses available, to ratio of faculty to student, and finally how affordable both options were. Something to be noted, in many areas, as state governments have had their budgets slashed, they've raised tuition, and have reduced the number of merit-based scholarships. A public university education is not as affordable as it once was. Meanwhile, with private universities, sure their tuition may be high, but they often have more merit-based scholarship money to offer to deserving students. If your student has done well all through high school, don't rule out private universities, based on cost alone, as many students are being offered generous scholarships at these institutions. For our daughters, they each received merit-based scholarships that will cover half of the tuition, at the small private university. This brought the overall cost down considerably, and made the private school competitive (cost-wise) with the public school. My daughters emailed their admissions counselor, on several occasions, requesting information on various financial concerns, such as scholarship renewal requirements for the scholarships they received. The admissions counselor has been a wealth of information for my daughters, and has guided them, step by step, through the entire process. Universities prefer to interact solely with the students, from the very beginning of the application process through graduation. They are adults, now, after all. The small school was definitely a better fit for my daughters. And so, that was their choice. We filled out the paperwork for Seattle Pacific University this past week and sent it in. Woohoo! One more thing done, sealed and delivered! I've also been doing a bit of spring cleaning and reorganizing. The family room was in need of some attention. I straightened, rearranged and cleared the room of winter clutter. I repotted a sickly looking plant into fresh soil, hoping that will help. (I am terrible with indoor plants.) 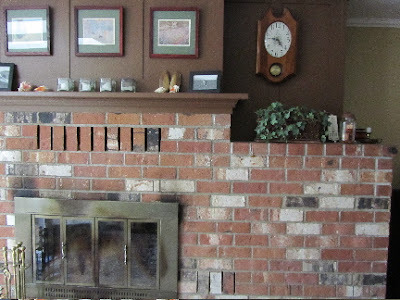 And I brought a faux ivy down from a shelf in the kitchen to the brick ledge above the fireplace. I took out some of my collection of seashells for the mantle, to put next to the photos of my kids at the beach. How about you? What's been keeping you busy this past week? One problem we have encountered with merit based scholarships is some of them drop off. It is kind of an ebb and flow because as some drop off, some become available but the student has to keep and eye on things all through out. It is NOT a one and done process. thanks for the heads-up on scholarships. We've sort of gone into this with the knowledge that every year we'll have to do something (as the scholarship itself has to be renewed, based on GPA). I've been greatly encouraged by what I've learned from some other parents. What's been keeping me busy? My grumpy, Eeyore-self, says I've been busy with migraines, physical therapy, and work. My happy-self says that I've got another flower bed cleaned, made a pot of chili, and spent a fun weekend with family. gosh, I'm sorry you've been dealing with migraines this week. So sorry about that, I know how miserable they are. And I didn't realize you were going through PT. I hope you're seeing signs of progress. But I'm glad to hear that you've still had good times. Just a wild guess, but the pot of chili, was this inspired by the chili cook-off you went to? What great chili-making tips did you learn there? Congratulations to your daughters :) Do they know what they want to study yet? We have a different system with university here, where the tuition payment is deferred until you start earning a over a certain amount (around $50,000 a year). Then a certain percentage is deducted from your paycheck to repay it. So because I haven't earned that much, I haven't had to pay anything back yet. how interesting. And if a graduate never lands a job paying that base amount (or becomes a stay-at-home parent, and doesn't have a paying job), how is the repayment handled? One daughter is interested in art and writing, and the other drama and early childhood development. We're still working on just how they'll make a living in these areas, Many ideas have come up, some of which could really suit each of them. I'll pass on the congratulations to them -- thanks. We have a similar system in the UK to Australia by the sound of it. Student loans that start being repaid when you get to earn over a certain amount. I'm not sure what the threshold is these days. Well done to your girls for getting the scholarships to their preferred uni. If I remember correctly (my husband had a small student loan when we first got married), we had to begin repaying the loan in about 6 months post graduation. It was small, so we paid it off as quickly as we could. But he was later laid off from work, and at that time, he could have requested a deferral on repayment until employed again (but I think interest would still accrue). I am hoping my daughters can get through their time at uni without loans. Sorry for the late reply - yep if you never earn over that amount you never have to pay it back. I think that also applies if you are a stay at home parent, but I'm not sure. And if you haven't paid it back by the time you die it disappears. I think they can do that because all universities are government-run rather than private. That's just incredible sounding! The public university here is more than $9000 for just one year. You don't want to know what a private university costs! And the loans stay with you, even if you are a stay at home parent. We are doing what we can to insure that our kids will not have student loans. My son has his degree, and is debt-free. We want to do the same for our two daughters. Your birthday cake looks incredibly lovely -- and I'm guessing it was just as delicious as it looks. I'm drooling! It was very delicious! I'll pass your compliments on to the cake decorators! You have a HEATILATOR in your home! I grew up with two in our house. You don't see tham very often. Happy belated birthday. Your girls did a great job on the cake. I have fruit in the freezer that needs to become jam. Perhaps the good example you gave will nudge me in the right direction. So that's what its called -- Heatilator. I've tried to explain to people what it is, but didn't have a name for it. It does a pretty good job warming the family room. But we need to get the fans fixed. Good luck with your jam-making! No, I haven't read that. I'll look in to it. Thanks for the info/link! I also grew up with a home with a heatilator. I didn't realize that they don't come standard with fireplaces until we bought our house, sans heatilator. Perhaps your daughters should consider setting up a special-occasion-cake-baking business! Beautiful job! Funny, I actually get recharged when I cook a lot. I think it's the solitary nature of it. I can just think away while I cook. Whereas, this afternoon, my two daughters had orthodontist appts that lasted 2 hours, complete with consults (2 of them) with the orthodontist for me. And all that "people time" just wore me out. I came home and wanted to just crawl under the covers and pull the sheets over my head. And how amazingly coincidental that you, too, had a heatilator. I had never seen one before buying this house, and now in one day, two people tell me they had them growing up! Ah, we are both introverts. We recharge when we are alone. I enjoy people (like on days I work) but quiet days at home feel really good sometimes. My nerves get jangled if I don't get enough quiet time. Me too. I find I need that quiet time to sort through my thoughts. Add me in. I absolutely need alone time! Cold and rainy here too, but the spring peepers have returned! It's great to have the university decision made. And all the baking looks wonderful! Well, cold and rainy beats cold and snowy, this time of year, at least. We're having a 3 day mostly sunny streak this week, then the rain comes back. I kind of like the back and forth between rain and sun. I appreciate both kinds of weather more when it's in limited supply. I hope you get a nice sunny streak soon! You have been very busy! Such a mix of activities-which requires much organization. What a beautiful time of life for your family, such big life events. congrats to your daughters, I wish them well in this new chapter of life! Thank you! Yes, it does feel like life is rushing towards us. It's exciting watching your kids grow into their adult selves. But also a bit sentimental. I love looking at old photos, but I find myself wondering how so much time could have passed already. Such is this life!